If you ask me, buying the perfect faux fur vest can be a little tricky…I mean, there are so many factors to consider. I know this because after a month of looking, I finally settled on a Zara one on eBay that would do, but it wasn’t my dream vest. I mean, when shopping; not only do you have to make sure it’s the right length, but you also have to ensure that the hair doesn’t look too fake AND that it’s in your price range—which can be sometimes be a bit of a tall order for one vest. But, it doesn’t have to be….not if you make it yourself, and that’s just what I decided to do. SUPPLIES: Needle and thread, hook and eyes, scissors, tissue paper (or tracing paper), some straight pins, a sample vest of any kind, silk lining (pictured below), a yard of faux fur, and a sewing machine. 1. 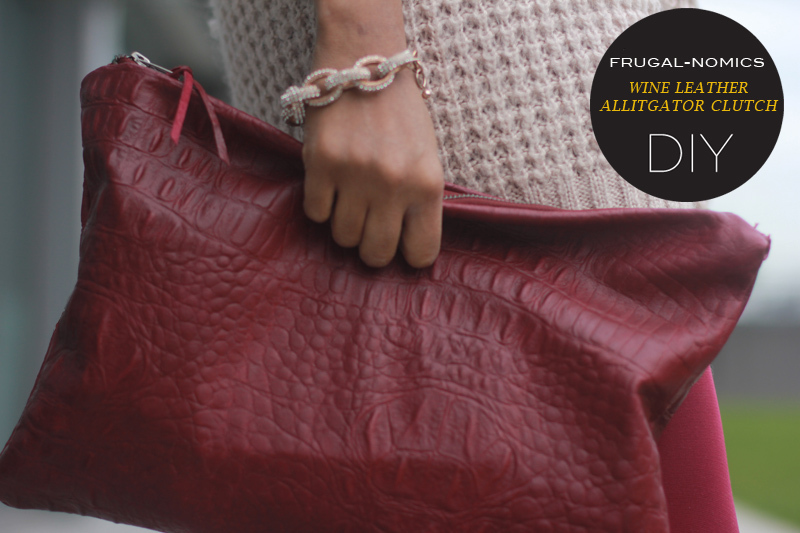 First you need to create a pattern…remember that vest you grabbed out of your closet? I started making the pattern with the back panel first. I used a thrifted denim jacket that I cut the sleeves off of — and cut it out (Note: I gave it about a 1.5 inch seam allowance on 3 of the sides, but about 2.5 inches at the bottom). 2. Here I used my tissue paper to trace one of the front panels to create a pattern for it. 3. 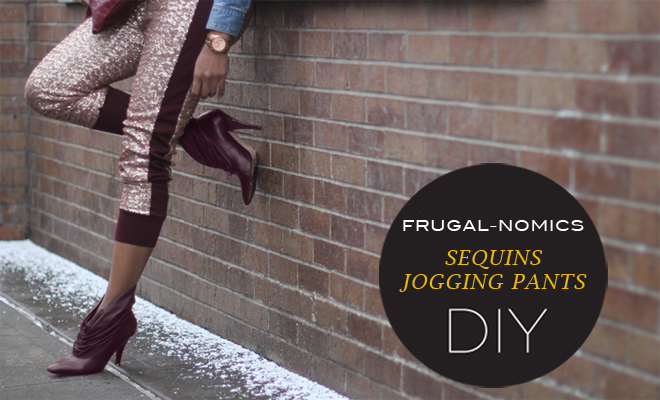 Cut out the form you created and go ahead and pin it to your fur. 4. Next, cut out all 3 pieces and pin each side panel to your back panel (right sides facing each other). 5. I wanted a collar on my vest and used the collar on my denim vest again as a guide (Note: I made my faux fur vest collar about 4 inches longer and made the ends squared off then pointed). 6. After you’ve cut out your collar, pin in to the top of your back panel. Looking good so far. 7. The under side of the faux fur was unfinished, kinda like carpeting. So I opted to add a lining to mine. 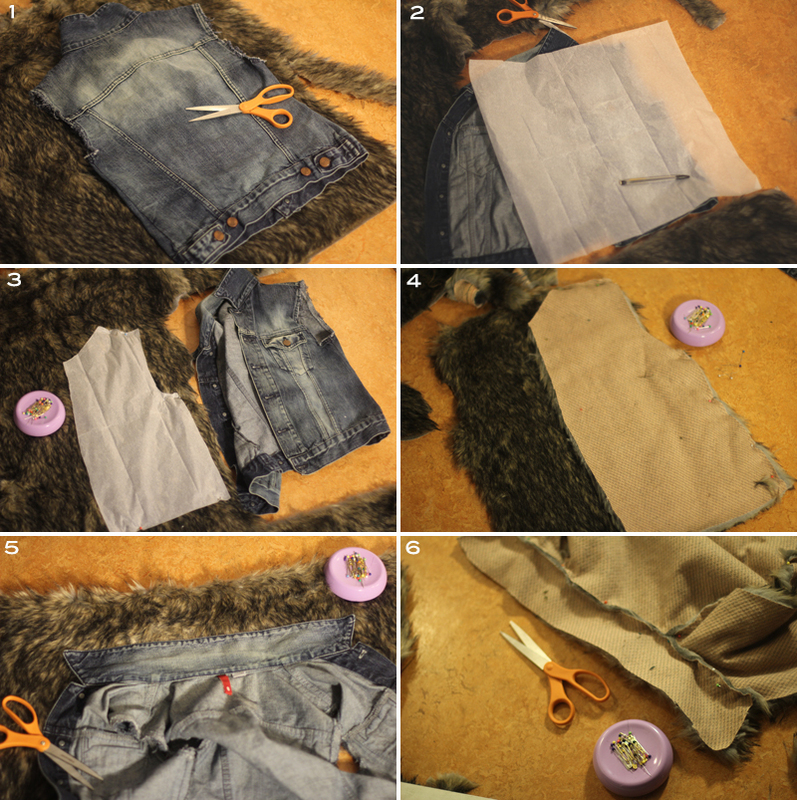 Therefore I used the patterns I created for the fur vest, to create another one with the lining. 8. Here I’ve started to cut out the front panels. Sew them all together the same way. 9. 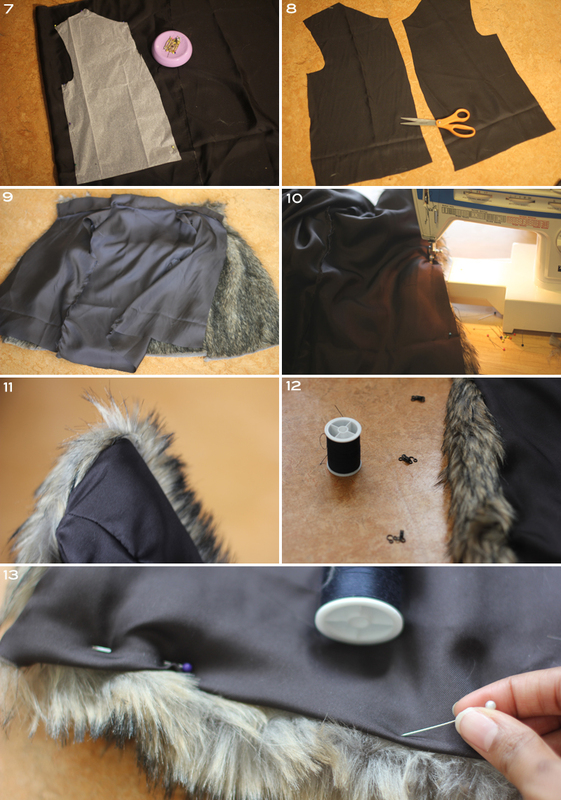 Now take your finished lining and fur vest and place them together (right sides facing each other), and use your straight pins to pin them together with a 1/4 inch seam allowance across the collar and down both sides of the front (Note: Leave the bottom hem open as well as the arm holes for now). 10. 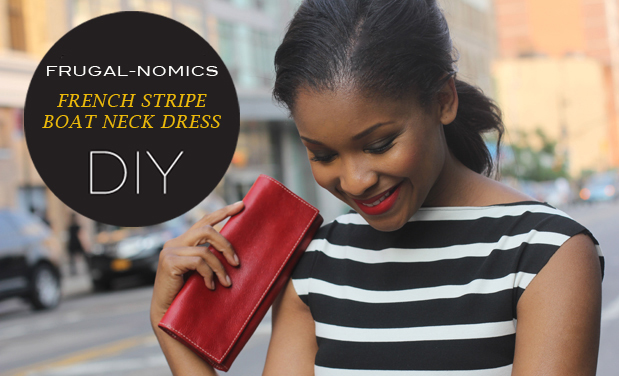 Now sew the two sides and collar that you just pinned. 11. You’re getting close, now flip the vest on the right side. 12. Take three hook and eyes and hand stitch them to the front of your vest. 13. Lastly pin the bottom hem as well as the arm holes, before you hand stitch them together, and you are all done! Thank you for the tutorial……I have just made it., so happy with it too! Mine is grey with a charcoal stripe . 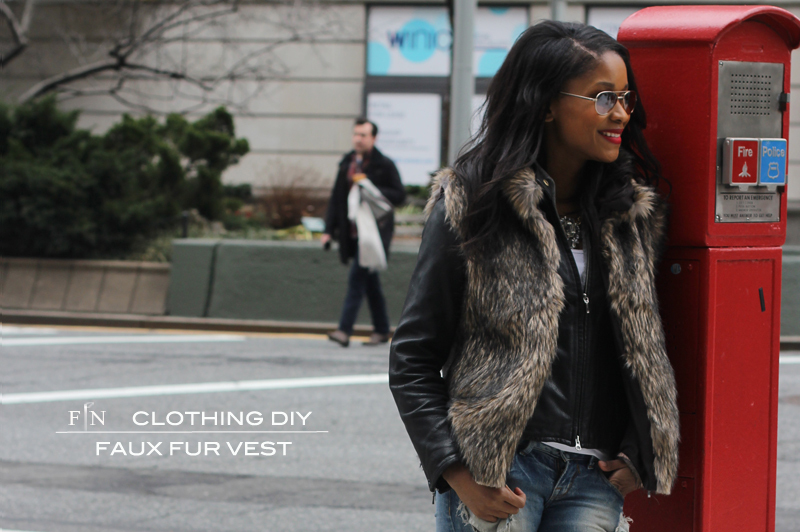 Thank you for the tips on how to make a faux fur vest. I’ve been looking high and low for one that would match my 6 feet frame and I just decided to give up (thinking sometimes it’s a curse to be so tall). I will definitely give yours a try.